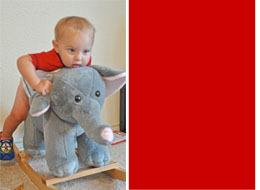 Micah is loving rocking on his rocking elephant lately. He also had a blast wearing his wooden clog slippers from Holland the other day. And the view while fixing breakfast instead of continuing the fun playtime?